Grace Material Handling Company supplies and services material handling equipment in the greater New York/New Jersey Metropolitan area, Pennsylvania and New England. We assist with the design, engineering and installation of material handling equipment and systems in manufacturing facilities, offices and warehouses. Some of our many accounts include: Serta Mattress, Bayer Aspirin, SAS Airlines, Pepsi Cola, Tropicana, Merck, BASF, Hoffman La Roche, Givaudan Roure, L’Oreal, Grumman Aerospace, N.Y. Blood Services, Scholastic Books, and more. In addition, Grace has installed material handling systems for companies throughout the United States and Puerto Rico over the years. With over 30 years experience, our professional staff is ready to serve your specific needs. For any size project or equipment requirement, Grace Material Handling Company is the answer. What separates the Grace Material Handling Company from other companies that merely try to sell rack? Installation of your system takes experience and know-how. Our crews work on new installations and tear-downs as well as retrofits. We know your business may require minimal or “zero” downtime, fast and efficient construction, and pinpoint accuracy. We deliver results. Grace Material Handling Company’s mission is to offer our customers the best in design, safety, and cost efficiency in all the storage rack systems we engineer and furnish. 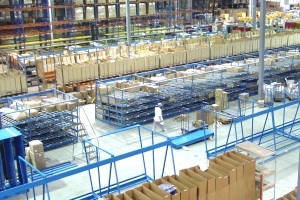 Whether your company needs racking for a retail area, building material storage, traditional warehousing, or a rack supported structure, Grace Material Handling has the personnel and products that will work for you.